Acoustic Sciences started back in 1984 as the company that made TubeTraps. Over the years, ASC has evolved into a premier specialty acoustic design and manufacturing operation. Everything is still 100% handmade in the USA. The TubeTrap was the world’s first factory-built broadband bass trap. Portable and extremely efficient, the TubeTrap had been fit with an acoustic crossover to create a treble range diffuser. This highly efficient bass trap/treble diffuser is the founding product that created today’s room acoustic products industry and has become an iconic acoustic fixture in the audio industry, it is the column in the corner so frequently seen in high-performance, high-power audio rooms. Because the TubeTrap was such a versatile acoustic device, it became an acoustic building block for recording engineers and audio experts to explore and experiment with acoustics in their small rooms. Notably, the 2C3D listening room, the AttackWall control room work station and the QSF recording technique for live rooms have set new standards in audio recording and playback which have become the reference by which other products are judged. Our success with developing high performance room acoustic interiors led us to a performance threshold. A new problem appeared, the uncontrolled vibration, aftershock or shudder of the structure of these rooms in response to being hammered by the intense pressures from powerful audio systems. We developed WallDamp in 1986 along with line of support products and construction techniques to remodel contractor built rooms into high performing listening and recording rooms. 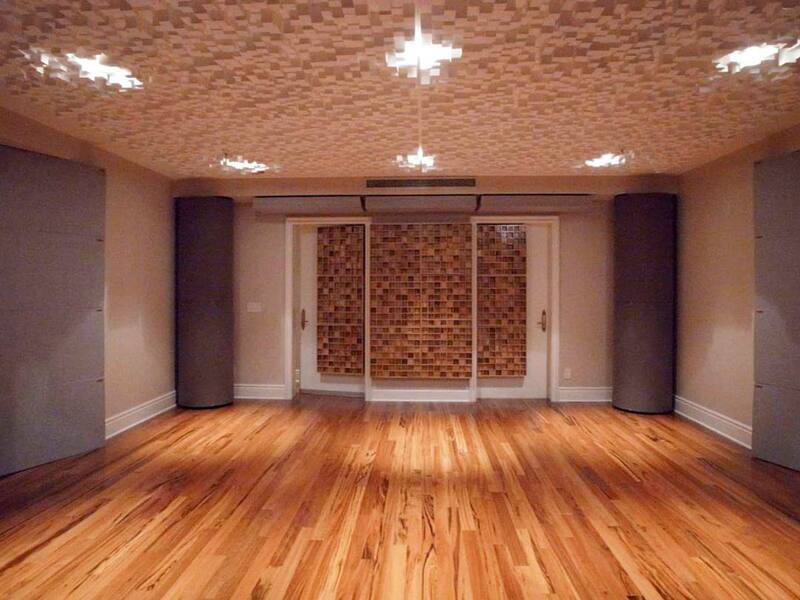 Although it looks like soundproofing, the structural conditioning of high performance audio rooms is really an extension of the sound conditioning project in the room, beyond the air, into the walls, floor and ceiling surfaces, by isolating and damping the vibrating surfaces of the room. The benefit of these calm “musical walls” is that they also became membrane bass traps which are very useful in absorbing the subwoofer range of sound. Over the years Acoustic Sciences have had the opportunity to develop hundreds of other sound and noise control products. Some of them were built only once, for a special project and many are intermittently built as needed in various projects. ASC keeps manufacturing jigs and manuals for every product they’ve made, and can always make more of them. They’ve built complicated acoustic products for other acoustic designers and architects, who entrust them to build their products for them, and keep their secrets confidential. In addition to making products Acoustic Sciences also solve problems. Making the products which were used to solve room acoustic problems taught them how to design room acoustics correctly in the first place. Now, they not only work with people to fix the poor acoustics of their situation but they help architects and owners design rooms and spaces that sound right the first time. Churches, restaurants, classrooms and offices are some of their additional areas of expertise. Half of Acoustic Sciences’ factory is dedicated to produce certain product lines. The rest is dedicated to new product development, prototypes and short run pre-production lines. This diversity in our capability keeps them always ready to tackle a new project or crank out some more of their old and well known products. ASC products are typically fairly complex compared to the common sound panels and acoustic foam products. ASC has remained in Eugene, Oregon under the same ownership since its inception. Arthur Noxon, physicist and state licensed acoustical engineer, also the inventor of the TubeTrap, continues still today as the owner, working president, and director of engineering of ASC. Hear Acoustic Sciences at Command Performance!